All the next week we watched the wheat without saying much about it. I saw Leslie on his way to school stop by one of the long strips of wheat. He pulled up a single stalk. I couldn’t see from where I was how it looked, but it seemed to come out easy. Then he walked slowly away before he began to run. The second wheat of April came off warm. The grass around the house was green, the aspens in the coulee shivered in their pale green leaves. The box elders that sprang up wild against the bank held out tight-furled green torches at the tips of their bare branches. “Well, let’s go down and look at the wheat again,” Dad said one morning, as though we hadn’t been watching it every day. “How you think it look, Ben?” Mom asked. Once again, the three of us sat on the seat of the truck while we went to see the wheat. I was driving and I went the long way around. “The road’s muddy the other way,” I said. I came around the first strip of stubble and parked. We made a procession across the road. The stubble creaked like an old basket as we walked over it. “There’s some brown, all right,” Mom said, pointing. We each studied every strip with our own eyes. Through the green wheat that stood already four inches high there were spots where the blades had turned brown and lay along the ground or drooped with a sick whitish-green, and here and there were bare moth-eaten places. I walked up a row and pulled up one of the brown withered stalks and felt it come away in my hand. I looked out over this strip and the one beyond. The brown stalks were only scattered. There were places where the wheat was deep green and thick. I pulled at a green stalk beside my foot, but it clung to the earth as though its root reached two feet deep. I looked at Dad. His face was thin and already burned by the wind. He had a stick or a match in his mouth and his lips gathered up around it as he considered. I could feel his impatience, that was still part of him even after all these years out here, in the way he took off his hat and put it on again and then felt for his package of cigarettes and lighted one with so much attention he hardly seemed interested in the wheat. When he got it lighted he turned back to the field. Mom had tramped ahead of us to look for herself. “How about it, Dad?” I couldn’t wait any longer. “Well,” he said slowly, “it’s spotty. There’s places where it winter-killed, but some of those spots were just wind-blown. It came through better than I thought it could. There’s enough good wheat for you to ride to school next fall on a first-class ticket, girl! All that through there has been slowed down a little because of the rain and cold these last weeks, but it’s blaze now. Anna!” he shouted. “Ben!” Mom’s voice across the strip had a warm excited sound to it. “Look over here! It’s good here. She done better than she look last week!” Mom came back to stand by Dad. “I thought you said I’d lose the combine!” Dad had a laugh in his voice. “Well, you might yet with hare or grasshoppers. Watch out!” Mom looked up at him with her eyes sparkling the way they did over a joke. I went back over to the truck. This afternoon I would bring Leslie down here to see the wheat that didn’t winter-kill. “See,” I would say, “it didn’t die out. Oh, in a few places, but look here—try to pull it up. See how strong and green it is?” Leslie would know what I meant. His eyes would shine. I slid in on the seat of the truck to wait for Mom and Dad. They had walked a little away along the strip. Now they were standing together. The looked smaller under the too-wide sky, Mom so thick and peasant-looking with her bandanna tied around her head, Dad spare and angular and a little round-shouldered. Why had I worried about them? I had been as blind in the world as Mom had said. They had love that was deep-rooted and stronger than love that grows easily. It gave me faith for my own life. “You can’t pick up faith at the cut-rate drugstore,” Warren had said. I must tell him sometime that faith had to grow like wheat, winter wheat. Love was like that, too…. Now I wanted to live my life with the strength of winter wheat, through drought, and rain and snow. “Hold your horses!” Dad yelled back. They came up the field together. I had not always been glad that I was their child, but today I had a kind of pride in being born to them. 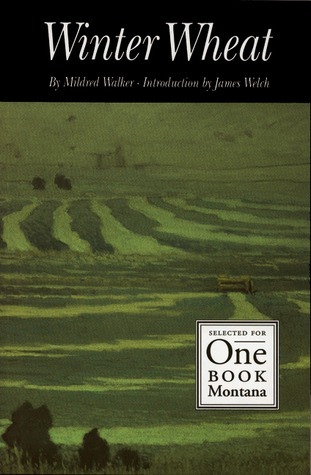 One of the most popular books set in Montana is Winter Wheat by Mildred Walker. In 2003, it was honored as a One Montana book. The following is an excerpt from this tempestuous novel, involving a young woman, her parents, and a romance. Reproduced from Winter Wheat by Mildred Walker by permission of the University of Nevada Press. Copyright 1944 by Harcourt, Brace and Company, Inc.